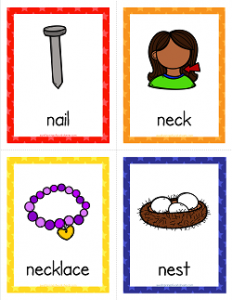 Here’s just what you’ve needed – a nice little nugget of things that start with n. These three pages of 12 cards will hopefully help you teach your kids about things starting with n. They include the words nail, neck, necklace, nest, net, nose, nurse, and nuts. Have your kids say the beginning sound a couple of times, then the word. You can tell them the words first, but after a few times I bet they’ll be able to tell you the words.